I originally discovered this band on someone else's vinyl blog but I can't remember whose. 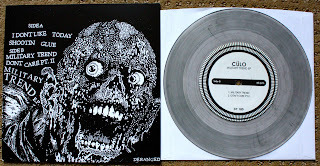 I saw this and the great cover art and I knew I had to have it, so I headed over to Deranged and put together a $25 (now $27) for 5 seven inches shipping bundle and got these three together, as well as a Young Offenders and Violent Minds 7". 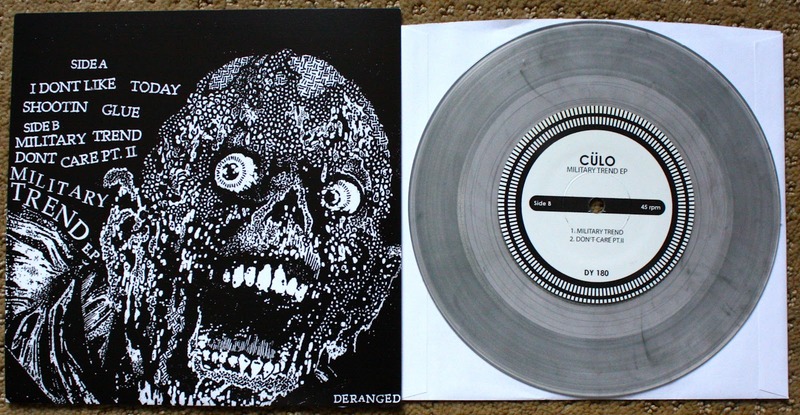 Culo is from Chicago and plays fast as hell lo-fi noisy thrash style punk. I am not even really sure how to describe it, and although this typically isn't my style this seven inch is pretty good. Both of the Toxic Vision seven inches are surprisingly still available and are only out of 100 each. I suggest picking these up before they are gone for good! They also have a 12" on blue vinyl out of 100 that I really want, but since it adds almost $20 to the shipping cost I just can't justify the purchase at this time. Why the hell does a 12" add so much more to shipping from Canada to the US??? I'll probably have to pull the trigger on it soon though because I don't want to be kicking myself if this band blows up, and those blue 12"s are going for stupid amounts on ebay.